The Afghanistan National Museum has been amazingly repaired and restored. It gets a much better "grade" from this homeschooling mom than the National Gallery of Art does! 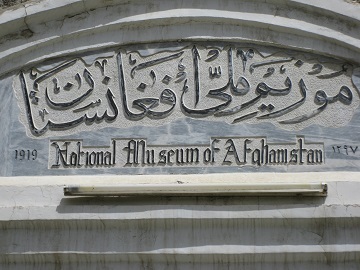 In the summer of 2009, another mom and I toured the Afghanistan National Museum with five American children. It was clean, cool, and had an apparently well-stocked laboratory where archeologists were working to clean ancient items. At the time, there was no vending or cafeteria, so bring your own water. There was a bathroom, but bring your own toilet paper. The National Museum was rocketed and looted during the fighting in the 1990's. Objects that could be looted, were. However, many amazing items have been recovered. The National Museum of Afghanistan has preserved priceless enscriptions, statutes, engravings, silver, pottery, stoneware, brassware, ancient coins, and may pre-Islamic and Islamic items. Of special note is the large collection of pictures and memorabilia remembering the town of Tashqurghan. It was destroyed in the fighting between the USSR and Afghan forces, due to the strategic location of the town. It should be clear that there are no oil paintings in the National Museum. At present, any oil paintings owned by the Government are located at the National Gallery of Afghanistan, closer to city center. The Bamyan Fine Art Gallery remains the best place to access any contemporary art being produced in Afghanistan today. 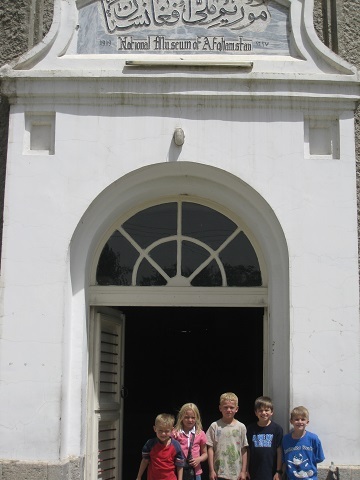 Here are my children and two friends touring the National Museum with us in the summer of 2009. We enjoyed a "normal" outing in war-torn Kabul. Because of security, I am posting a "tour" of the National Museum in the pages to follow. Enjoy seeing some of the culture that Afghanistan has to offer!